Is a lack of organic traffic losing you business? If people can’t find your site in search results, you’re missing out on traffic, leads, and sales. One of the best ways to solve that problem and boost your traffic is with keyword research tools. The reason keywords are important for increasing organic traffic is because searchers only find content if Google thinks it’s relevant to what they’re searching for. Google uses keywords as an important SEO ranking factor. That means that the best way to help search engines understand that your content is relevant is to include, in a natural way, the same exact terms that people are typing into Google to find you. Use the right terms, and your content will be more visible in search engine results pages (SERPs), resulting in more clicks and more organic traffic. 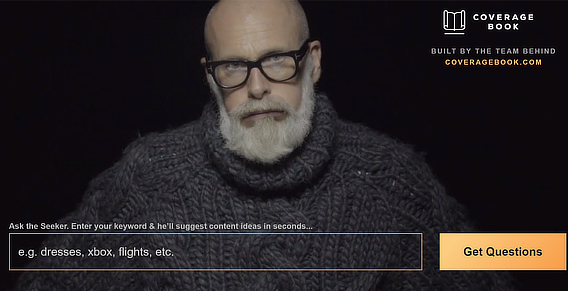 So, how do you discover which terms people are using to try to find your content? 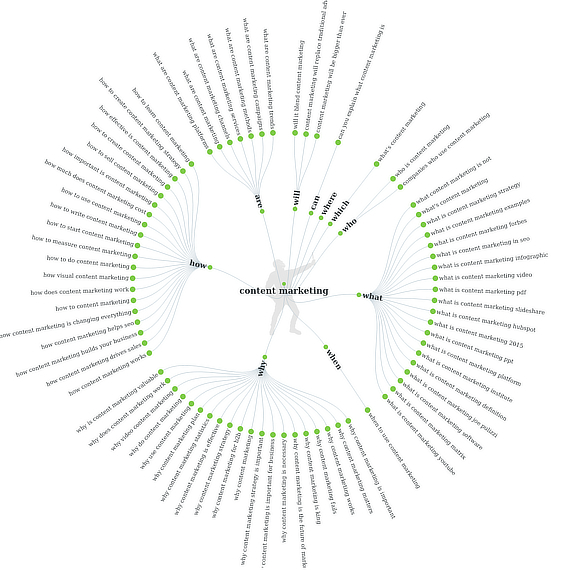 By including keyword research tools in your content marketing toolbox. One of the advantages of using keyword research tools is to get more terms you can use in your content, backed by data on popularity, usage, and more. Our last keyword research guide covered why keyword research is relevant, types of keywords, understanding keyword intent (what searchers want), and much more. In this guide, we’re sharing our picks for the best keyword research tools to help you get started. For each keyword research tool, we’ll walk you through how to find keywords you can use to optimize your content for better search positioning. Recommended Resource: Need more website traffic? Learn how to rank #1 on Google with our Ultimate Guide to SEO in 2018. While keyword research tools are all different, they all work in basically the same way: you have to start by typing in keywords to learn more about them and get ideas for related keywords. That means that before you get started using keyword research tools, you need to have an initial list of keywords to research. How do you come up with those initial keywords, also called seed keywords? The best way to to start is simply by using your own common sense and brainstorming terms related to your topic. Start by defining your broad topic – let’s use “health insurance” as our example. From there, you can brainstorm some more specific terms. 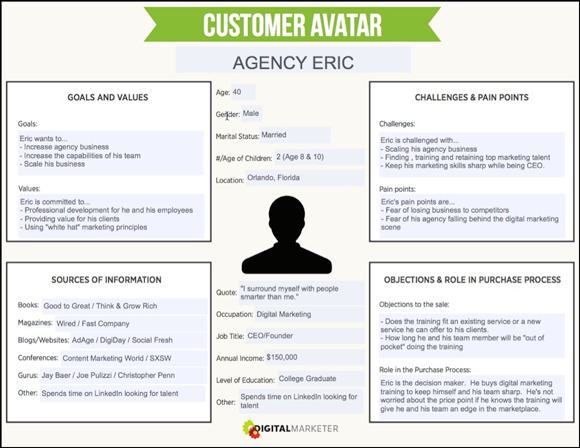 If you’ve created buyer personas, also called customer avatars, this step will be much easier. You’ll be able to put yourself in your readers’ shoes and imagine what they would type into Google to find your content. Continuing with our health insurance example, “health insurance benefits calculator” is a more specific term that your target audience might be interested in search for. Try to come up with at least 5 specific ideas along those lines. After you’ve brainstormed a list of specific keyword ideas to research, you’re ready to get started on your research. Ahrefs is an incredibly rich collection of tools, with data on trillions of links. For this guide, we’re going to focus on the Keywords Explorer, which is one of the best keyword research tools around. Here’s how you use it. 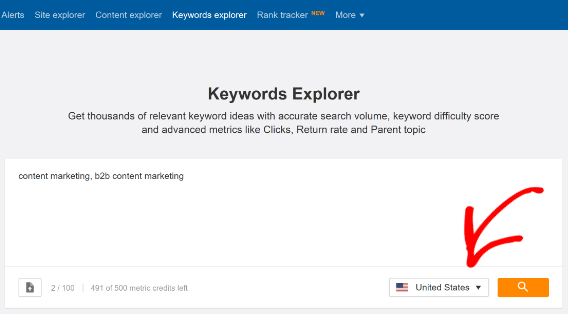 Login to Ahrefs, then navigate to the Keywords Explorer. Type some terms related to your topic into the onscreen search box. You can have up to 100. Choose your country. Ahrefs includes keyword data for dozens of countries. For this guide, we’re using the US. Press the search icon. You’ll be redirected to a new screen which will gradually fill with charts and data. When the results are in, scroll down the page to see the keyword difficulty ranking. As Ahrefs explains, this tells you at a glance how hard it will be to rank for different terms. 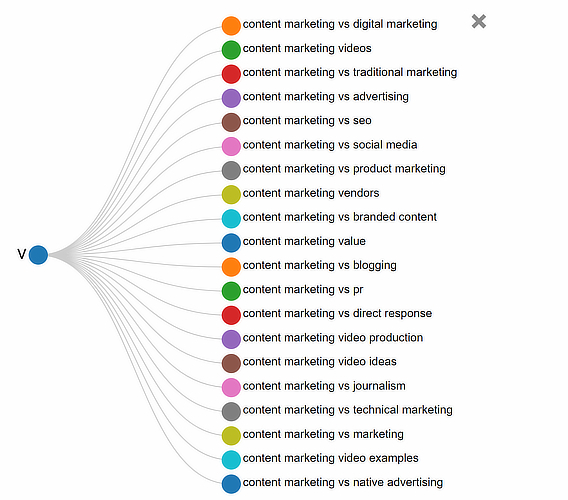 For example the keyword difficulty for “content marketing” is much higher than for “b2b content marketing”. This reflects the fact that it’s more challenging to achieve a good position in SERPs for broad, well-covered topics. Further down the page, you’ll see the Keyword ideas section. For each, you can click the View full report link for more details. Let’s look at the full report for keywords that include the original search term of “content marketing”. This will help you identify related content areas that you might not have covered yet. The data appears in a table, with a list of related terms. To get full information on each term, click on Get metrics. This will fill in information on keyword difficulty, SERP, and more. The Clicks column estimates how many clicks you’ll get if content optimized for this keyword appears in search. That’s a good indicator of potential traffic. It’s also worth paying attention to the Parent topic for each search term. Ahrefs groups its results into a number of parent topics. For example, if you search for “b2b content marketing”, the parent topic is “content marketing”. Clicking on the parent topic link can lead you to more keywords to use in your content, and help you to find sub-topics around which to create or optimize content. You can also how the topic and sub-topics rank in search engine results. You can do this with pen and paper, or create your own spreadsheet. If you use a spreadsheet, then it’s helpful that Ahrefs allows you to download potential content keywords by clicking on the Export button at the top of any table. You can try out Ahrefs for a week for just $7. After that, it’s just $99 a month for the whole suite of tools, which include their Site Explorer, Content Explorer, and much more. Like Ahrefs, SEMRush provides a huge amount of data to help you with search marketing. You can test it out with a free keyword search from the home page. However, if you want to do multiple keyword searches, you’ll have to upgrade. Here’s how you use SEMRush. 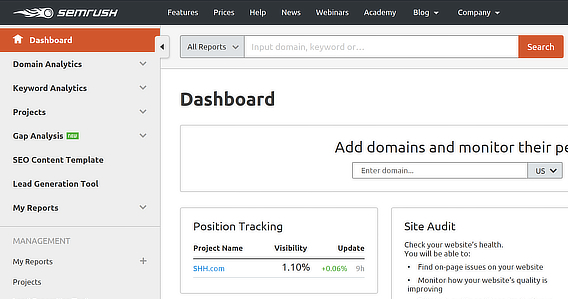 Login to your account and click on Keyword Analytics in the left sidebar. Go to Overview and type your chosen search terms into the search box. Remember, you’ll have brainstormed some of these at the start of your keyword research process. We’ve used “b2b content marketing”. Press Search. The results will come up in a dashboard showing search volume, paid search (the cost of paying for placement in search results for that keyword), cost per click distribution and search trends. SEMRush also includes data on the top pages ranking for particular keywords. You can use this information to come up with ideas for new topics to cover on your blog. Start by scrolling down to see Phrase Match Keywords (those that include your search term exactly) and Related Keywords. These will give you some initial ideas for keywords to include in your content. The Related Keywords report is important because it may contain terms you haven’t yet optimized your content for. To get more detail on related keywords, click on View Full Report. There’s a link to cached search results (a snapshot of the search results page on a particular date) at the end of each line of the table. This is a good way to see which pages are getting traffic now, so you know what the competition is and whether you can create better content and win the clicks. Click on any keyword to get a similar report for that keyword. Sort SEMRush data by any column to get new insights. For example, you can sort by keyword difficulty to identify keywords related to your content with a low to medium keyword difficulty that you could use to optimize content. As with Ahrefs, jot down content keyword ideas as you go through SEMRush. Even better, you can export keywords at any time, either from individual reports or via the Export Manager. SEMRush pricing starts at $99 per month, which includes access to keyword analytics, site position tracking, social media tools, content optimization tools, and much more. Answer the Public is one of the quirkiest SEO keyword tools around, and you can’t beat the price tag of free. While you can use Answer the Public for any kind of keyword research, it really shines as a way to help you find the questions people are actually asking. This is important because people don’t just type queries into search engines any more; they also search by voice, often via their mobile devices. That means searches are often in a question format, rather than simply being a typed keyword phrase. Answer the Public is one of the best keyword research tools to help you find these questions, so you can optimize your content and boost organic traffic. Here’s how you find the questions. Type your search term into the search box on the homepage of the Answer the Public website. We’re using “content marketing”. Use the onscreen selector to change the language if desired. Press Get Questions or use the enter key. You’ll be redirected to another page with all the questions. By default, the questions are displayed in a big wheel, with each of the key question words leading to related questions. The question words include who, what, why, where, when and how, as well as others like can, which, are and will. Scroll down the page to see other question wheels with questions relevant to your search using prepositions, comparisons, related terms and more. There’s even a list of search terms combined with different letters of the alphabet. If you prefer not to use the wheel interface, you can click the Data button above any section to display the results in a table. Click the Visualization button at any time to return to the default display. Similarly, you can download results both as images and as spreadsheet files. 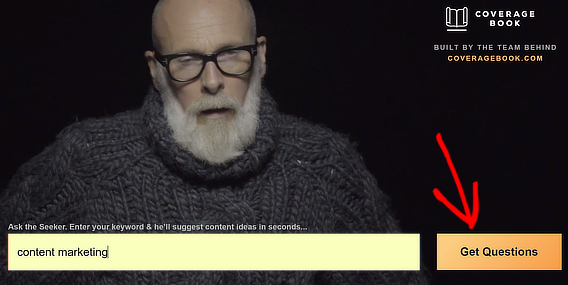 As with other keyword suggestion tools, you can use Answer the Public to quickly get content ideas, and explore ways to add value to your existing content. Click on any question to go to the related Google search page. That can point you to other questions you might find useful. Exploring the Google search results can also help you assess how people have previously covered a topic, so you can see if there’s a new angle or another way to make your own content more valuable. That’s a great way to boost organic traffic rankings. 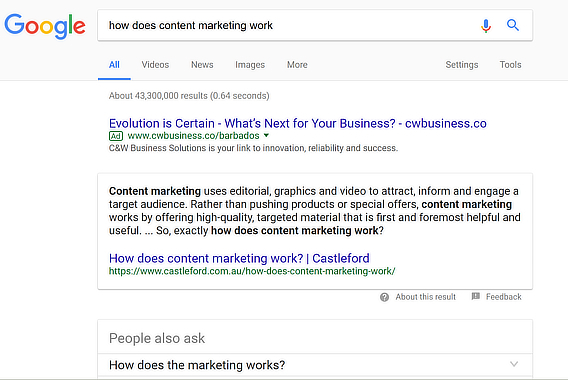 And don’t forget that answering questions well can lead to getting featured snippets which appear above the search results, so Answer the Public can help you spot those opportunities, too. That’s why it’s one of the best keyword research tools around. 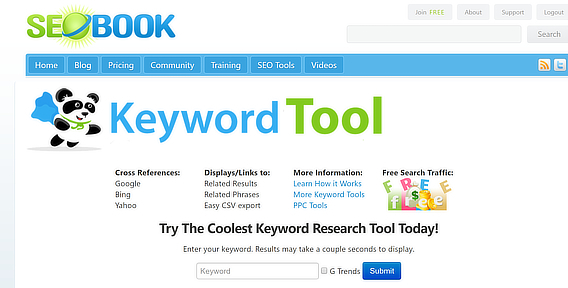 The SEOBook Keyword Suggestion Tool is one of several free SEO tools from SEOBook. However, you’ll have to sign up for a free account to use it. This keyword search tool includes a wealth of information when you search, including search volumes, related results and phrases, and estimated cost per click (CPC) for any keyword you input. You can also click a box to see Google Trends results. It’s a good idea to read the column by column feature description provided under every page of results, so you understand the data SEOBook provides. To get started, put your keywords into the onscreen search box, and press Submit. You’ll get a table with related phrases, and US and UK monthly search volume. You’ll also see daily search volume for Google, Bing and Yahoo. Click on any of the underlined numbers to go directly to the search engine page for that query. Each keyword phrase also has a CPC value. This tells you how popular the keyword is for advertising, and therefore how likely it is that people will be searching for it. Click on any result to see the same data for related searches for that term. You can also export search results in spreadsheet format at any time. As with other tools, the SEOBook Keyword Suggestion Tool is useful for identifying phrases to include in existing content, or to help you create new content around topics where there’s an opportunity. 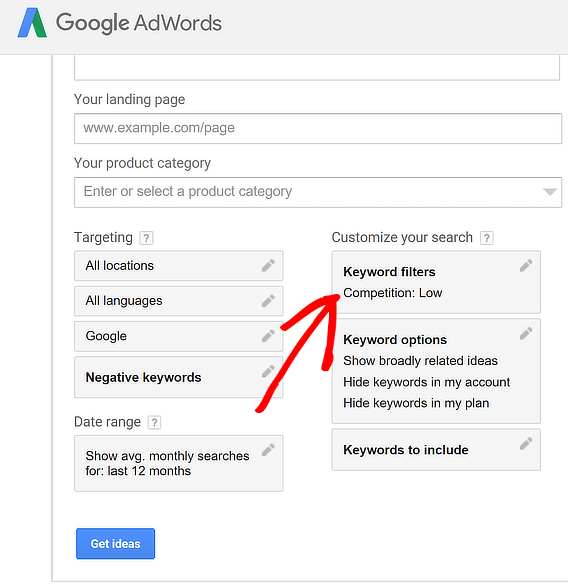 The Google AdWords Keyword Planner tool is intended to help people find the right keywords to bid on for pay per click and paid search marketing. However, it also functions as a great way to figure out which keyword phrases you can use in your content to boost your organic traffic. That’s because it draws on all the data Google has on searches performed via its own search engine. The price tag – it’s free – is just one of the reasons it’s made our list of the best keyword research tools. You’ll need a Google Adwords account to get started. 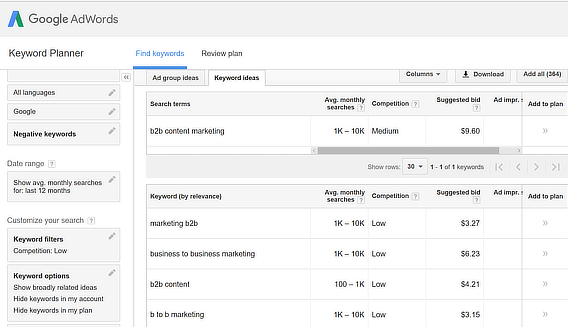 Click on the three dot menu, then click Planning » Keyword Planner. The tool will launch in a new window. 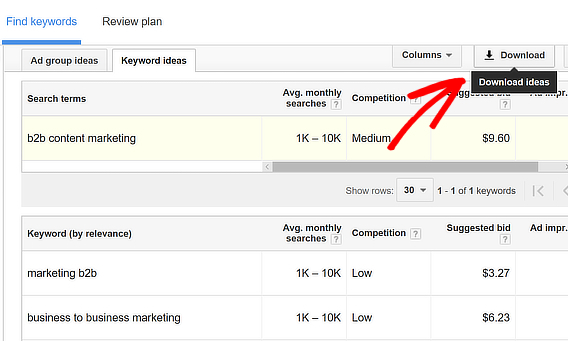 To find content keywords, we’ll use the section that says Find new keywords and get search volume data. Enter your product – this is a good place to put a couple of keyword phrases to start with. Input the URL of your landing page – this option is primarily for those buying ads, but entering the URL of a page you’re planning to optimize can throw up some useful options. Choose a product category – again, this makes more sense for ad buyers, but can result in some desirable keywords. 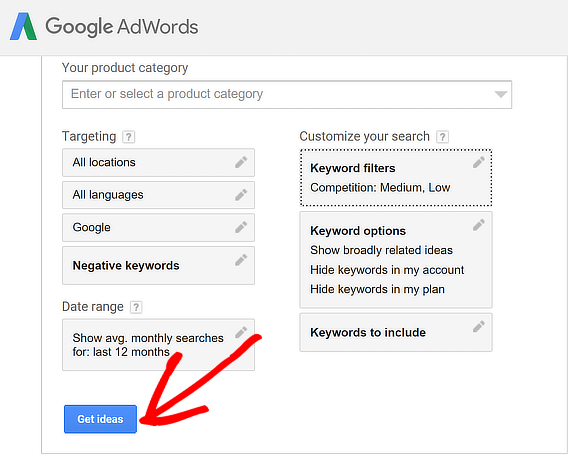 For this tutorial, we’re going to focus on entering keywords into the product field. We’ll use “content marketing”. However, we’re going to stick with the default options. In the boxes on the right, you can choose keyword filters. Competition is an important one. 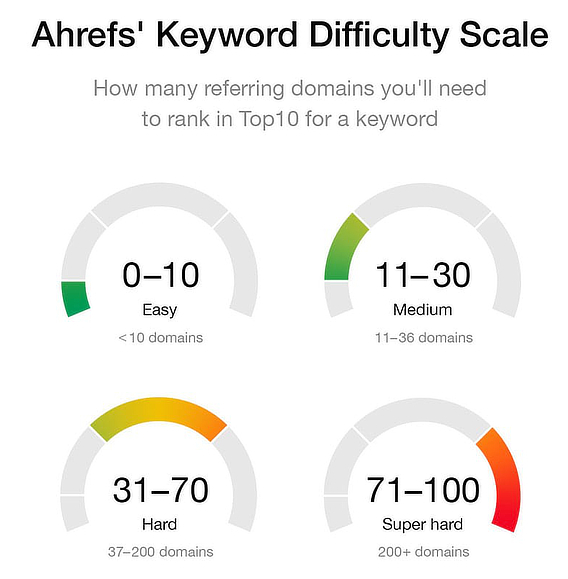 Like keyword difficulty in other tools, the competition metric assesses how difficult it might be to compete with particular keywords. 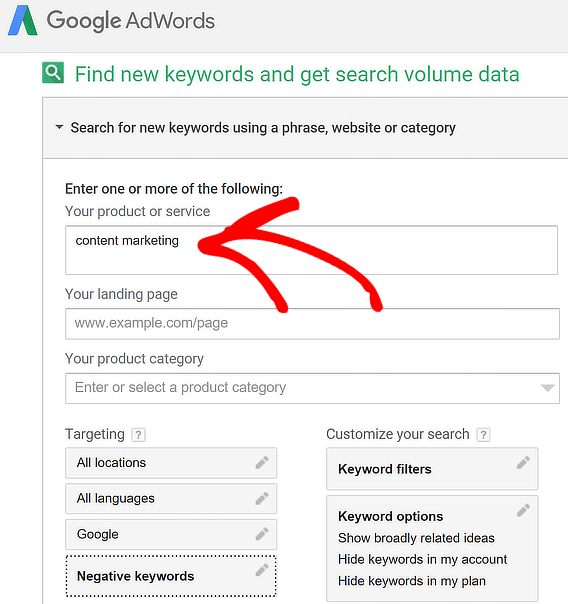 Since we’re looking for keywords where we can make an impact, we’re going to click Low to find less competitive keywords, then Save. Next, click on Get Ideas to go to the results page. On the results page, you’ll see the filters you’ve used in the left column, and the results on the right, under Keyword ideas. You can change the filters at any time. Suggested bid. This is for ad buyers, but it’s worth knowing that the higher the figure, the more popular the keyword is, and the better the indication of commercial intent. You can hit the download button to export your results to a spreadsheet to explore them later. 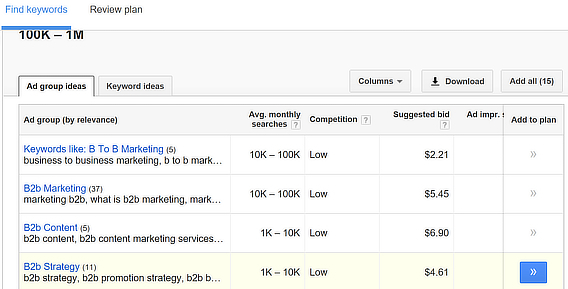 The results page also includes an Ad group ideas tab. This is worth exploring, as it includes broad topic groups that can be useful for focusing content. Click on any of them to see what keywords are included. As with other tools, make a note of keyword phrases and topics that interest you. You can follow the same process to run another keyword search and refine your content keywords even further. That’s it! Whether you use a single keyword research tool, or combine all of our picks for the best keyword research tools, you should end up with a list of relevant keywords to integrate into your existing content, as well as some ideas for creating new content. Use keywords in page titles and descriptions, as social media hashtags, and wherever it’s appropriate in your content, focusing on making it relevant to your audience, and readable, too. Recommended Resource: What’s next? How do you use your keywords without keyword stuffing? See our guide on SEO Made Simple: Where & How To Use Keywords in Your Content to use your keywords the RIGHT way. Don’t forget to also perform an SEO audit to catch any errors tanking your traffic, and identify opportunities to boost your rankings even more. In addition to content marketing, using keyword research tools will also help you with SEO, lead generation and email marketing. Once your content is ready, try testing its effectiveness with split testing so you can optimize it even further, and boost your organic traffic even more. Finally, don’t forget to follow us on Facebook and Twitter to keep up to date with upcoming guides and tutorials. Good article, like the customer avatar page you linked to. I think you missed a good one, Keywordtool.io. Their metrics and operation are super easy to use, and their related keywords and FAQ lookup tab make it even easier to get all the shoulder niches and info needed to see the market imo.. Thanks for the tip, Justin. 🙂 Our expert roundup on SEO tips for the coming year is a useful follow-up to this article.